A way to get involved in cleaning up our islands. UVI and VI EPSCOR are teaming up to battle trash build up with the second annual Great Mangrove Clean Up Saturday April 13. The 2ndAnnual Great Mangrove Cleanup of the St. Thomas East End Reserves (STEER), took place Saturday, April 13. STEER is a marine protected area on the east end of St. Thomas. 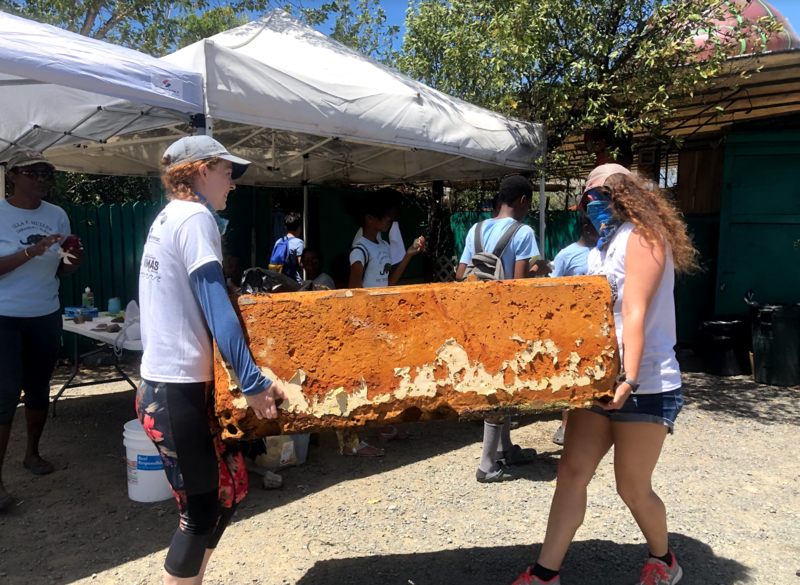 115 volunteers, ages 9-70, removed 1,786 pounds of debris from mangrove shorelines in kayak-based and land-based cleanups of mangrove shorelines. The groups said the first annual cleanup showed more than 3,000 pounds of trash was removed from the mangrove shorelines. “It was exciting to see so many people come out for this event, again this year. Working together we removed nearly 1,800 pounds of trash – that’s a big impact! Like last year, the most common item we collected were plastic beverage bottles. What that tells me, is that plastic beverage bottles are a consistent marine debris problem for St. Thomas, so we should all be thinking more about what we are drinking out of, where we dispose of it, and where it may end up,” Dr. Kristin Grimes, Assistant Professor, Center for Marine & Environmental Studies, University of the Virgin Islands said. They said it was only possible with the support of volunteers in the community. Students from the University of the Virgin Islands, Ivanna Eudora Kean High School, Charlotte Amalie High School, Bertha C. Boschulte Middle School, Ulla F. Muller Elementary School, Joseph Sibilly Elementary School, and home school students, participated in the Cleanup, along with individuals from 13 other organizations. Sponsors of the event included University of the Virgin Islands Center for Marine & Environmental Studies, Virgin Islands Department of Planning & Natural Resources, Virgin Islands Marine Advisory Service, Virgin Islands Established Program to Stimulate Competitive Research, Virgin Islands EcoTours, St. Thomas Recovery Team, Pizza Pi, Yes! Waste Management, Virgin Islands Marine Rebuild Fund, and the National Oceanic & Atmospheric Administration’s Marine Debris Program.